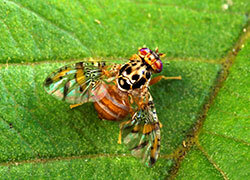 Mediterranean fruit fly (Medfly) is one of the world’s most destructive fruit pests. It’s wide host range and tolerance of cooler climates makes it highly invasive. Medfly has successfully spread and established in many parts of the world. Host fruits and vegetables are a vital part of the Medfly lifecycle and affected fruit is unsaleable. Economic impacts for fruit and vegetable producers include reduced yield and quality, increased control costs and lost markets as many countries and regions regulate against Medfly. Medfly larvae are creamy-white and about 7–8 mm long (Figure 2). In comparison, Queensland fruit fly is larger (7-8 mm), reddish brown in colour with yellow markings and no visible markings on the wings. An adult Medfly is 3–5 mm long and yellowish brown in colour. The patterned wings have yellowish brown bands extending to the wing tips (Figure 1). Fruit and fruiting vegetables are damaged by Medfly egg deposits, larvae feeding and infection by secondary diseases. Fruit infested with Medfly larvae may show ‘sting’ marks on the surface where females have deposited eggs. Eggs laid into hard, green, unripened fruit may cause fruit development to become distorted. Larvae feed inside mature fruit, creating tunnels from the surface to the centre (Figure 2). A water soaked appearance may develop on the surface of the fruit around the entry point. Fruit rot due to secondary infection often occurs with fruit fly infestations. Infected fruit will drop from the tree or rot on the tree. Medfly females deposit eggs under the skin of host fruit that is just beginning to ripen. Eggs hatch within 2−4 days and larvae tunnel towards the centre of the fruit to feed. 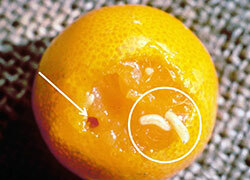 Larvae developing inside the fruit can be seen when the fruit is cut open, or when exiting the fruit to pupate. Larvae emerge from the fruit after 6–11 days of feeding and fall to the ground. Pupation usually occurs under the soil surface with adults emerging after 6−11 days. Most females are ready to mate 6−8 days after emerging and can lay as many as 22 eggs per day. Adults can live for up to 2 months and usually lay around 300 eggs (though up to 800) in a lifetime. Medfly has a very wide host range, infecting the fruit of over 260 different plant species. Economically important host species include apple, pear, citrus, stonefruits, coffee, mango, persimmon, guava, fruiting vegetables, avocado, berries, cotton, grapes, melons, olive, kiwifruit, various nuts, passionfruit, lychee and banana. Locally, adults spread by flying. Flight distance is restricted to less than 1 km. Long distance spread of Medfly occurs with the transport of larvae in infested fruit. Medfly originates from and is widespread in Africa. Medfly has spread and established in Europe, the Middle East, Central and South America, Hawaii and Western Australia. The majority of Australia is free of Medfly. Medfly was discovered in Perth in 1895. Regulation and pest management practices have restricted Medfly distribution to WA, where it has established from Esperance through to Carnarvon, Broome and Derby. Quarantine boundaries and procedures have been established in Australia to prevent the spread of Medfly from known infested areas in Western Australia to regions and states currently free of Medfly. Each state or territory has their own regulations in place to prevent the introduction of Medfly or control its spread. For specific import conditions, contact the relevant state authority. New South Wales is currently free of Medfly and the introduction of any host fruit or soil from a Medfly infested area is strictly regulated. It is illegal to move host fruit or soil that originates from, or has moved through, a State or Territory with a known infestation of Medfly into New South Wales unless certified as having met specific import conditions. Surveillance for Medfly is carried out with the use of traps targeting adults. Traps are continuously positioned throughout likely areas where Medfly might appear. Regular surveillance in New South Wales occurs with Medfly traps located in Sydney and other production areas. This surveillance provides both an early detection mechanism and negative trap results to demonstrate New South Wales' freedom from Medfly for market access. The distance between New South Wales and current Medfly populations in Western Australia means that New South Wales is relatively safe from the natural spread of Medfly through flight. Introduction of Medfly to New South Wales is likely to be a result of unintentional movement of larvae in infested host fruits or pupae in soil. Regulations concerning the movement of Medfly host fruits and associated materials (e.g. transport bins, soil) into New South Wales should be observed at all times. Good farm hygiene by removing and destroying fallen fruits reduces the number of breeding sites for Medflies and other fruit fly pests. This in turn can slow population increase and support eradication efforts. A number of management options are currently practised for the control of Medfly, either alone or in combination. An important measure to ensure success of any control method is the disposal of fallen fruit (Figure 3). This basic hygiene measure, referred to as sanitation, is the basis for most pest control programs. 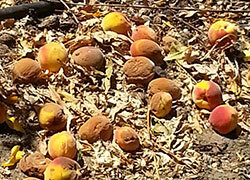 Where fruit cannot be picked up and destroyed, fruit should be mulched by farm machinery so that fruit rots. Bait sprays combine a source of protein with an insecticide. Both male and female fruit flies are attracted to the protein source. Bait sprays can be applied to just a few spots in a field or orchard and the flies will be attracted to these spots (Figure 4). Bait spraying selectively targets fruit flies and conserves many beneficial insects. Cover spraying involves applying insecticides as very fine droplets to entire trees, including the fruit. Cover sprays are not selective and are generally used only when fruit fly numbers become unmanageable to bring populations back under control. Cover spraying controls all life stages of fruit fly. Most cover sprays only kill adult flies on contact, and the population will increase again in two to three weeks if no other control is carried out. 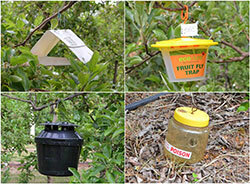 A wide range of fruit fly traps are available (Figure 5). Traps specific to fruit fly are generally composed of a lure and a killing agent. The most common traps for fruit fly contain synthetic lures that mimic fruit fly pheromones. These lures are attractive to male fruit flies. Food based lures are also available that work in a similar way to bait sprays. These attract both female and male fruit flies. The correct density of traps must be installed to provide effective control and will differ between trap types. Sterile insect technique (SIT) involves releasing large numbers of sterile males into wild fruit fly populations. Sterile males mate with females in the wild population, resulting in the production of infertile eggs. This results in a rapid decline in wild populations. Wrapping fruit is one of the most effective, though labour intensive, control techniques against fruit flies. This technique is more suited to home gardeners than commercial producers. Wrapping fruit with newspaper, paper bag or polythene sleeve creates a simple physical barrier to egg laying. For the barrier to be effective, it must be applied before the stage at which the fruit is attacked. There are conditions of movement relating to Medfly set out in the Biosecurity Order (Permitted Activities) 2017, under the Biosecurity Act 2015. Part 2 of the Order outlines conditions for importation of host fruit, soil and packaging likely to introduce Medfly into NSW.